Howie D. and his family are on the NKOTBSB World tour 2012, someone casts a spells on them, it isn't whom they think. His family, friends, and fans, even some he doesn't like at all, come to save the day. Set from Memorial Day to the Monday after the Fourth of July! Read and Enjoy! 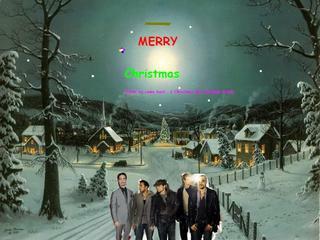 Series: Backstreet Boys 's Holidays 2011/2012 Series! Story: Howie must save the group, NKOTB, fans, and their families from unknown witches and spells. Song: Song is about falling so deep in love you can't get over the person. AJ's song for the Valentine's Day Romance fanfiction. AJ Mclean has just gotten married and couldn't be happier or so it seems. Till one day, they have a fight and they decide to go their seperate ways for a couple days. Which leads to AJ dreaming what his life would have been like if he and Justin Timberlake had changed places. What if he had dated Alyssa Milano back ten years or more? What is love? True love? Why does he love people who don't always act like they love him? Does that mean they don't love him or BSB at all as friends? What about his half family? 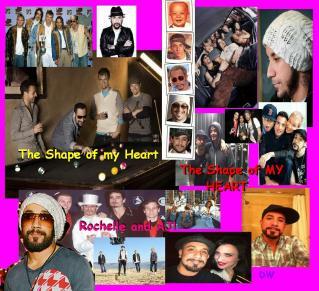 Go with AJ Mclean, Justin Timberlake,the Backstreet Boys, The "Charmed" cast, all seasons and more! Nick has just broken up with alot of girlfriends and "one night" girls. He is feeling down when he meets the love of his life. But they break up within a year. Soon after he starts going after himself, can this new love come back and save him, or were all those promises of love, friendship, and faith, and believing in God, just lies? Can he feel love again? Will he respect himself again? Will he stop dreaming of being a lost priavteer and pirate at sea? Will he stop dreaming of his dreams and losing them? WILL NICK NO LONGER BE, LOST? LOST WITHOUT YOU? A song from my Nick Carter fanfic as written by me with Piano chords. Enjoy, it's only a 3 chords at a time song, but it goes with the song to the woman he wants to marry, enjoy. Rochelle begins working as a make up artist for The Backstreet Boys on their tours and training during the Millennium Tour. But in between AJ going in and out of rehab hurting himself and those that love him. Can they make it last? We'll see. This is only rated R, by request of a friend, I like to call "Wheaties". There is some cussing and some adult actions NO ONE SHOULD EVER DO EXCESSIVELY OR ABUSE AS SEEN ON HERE. I CONDONE IT. TEENS AND KIDS, DON'T DO IT, IF YOUR READING THIS. The Backstreet Boys are celebrating St. Patrick's and Easter, and their friends are celebrating Passover. Darn the luck, Nick is finishing his directoring and Photography degree as the group prepares for their Up Close and Personal Tour. Explains what he believes and why the world seems to hate them. Can Nick from the bullies, and save his relationship with his new girlfriend? Can he celebrate 3 holidays and still not get in trouble and pass his classes, before the next tour, find out? Dedicated in the memory of Leslie Carter. It is 1995 and the Backstreet Boys are touring Europe. All but Brian are into playing women and using them for psychological, emotional, spritual, and sexual games. Till they meet a foxy woman, named Angela. That changes the game and makes Howie fall in love for the first time. Then plays him and the guys, and sends Kevin back to Kristen after a huge fight. Is she more than that? Well BSB ever grow up? Will Nick become afraid of committed realationships? Will Nick ever date and marry a geek or nerd or simply a common sense smart girl? Who knows? Read it and find out! BSB has Christmas!!!!!!!! As a fan wins a chance on the cruise to have BSB come to her small hometown in Minnesota for Christmas with the group and their families. As Santa needs help from BSB to defeat "The Scrooger" from destroying the holidays for the whole world. As romances heat up and cool down, as fights happen, and tears shed will BSB even be around for next year? Will BSB find the true meaning of Christmas, Jesus, and the Holidays? Will they figure it all out, by the 27th this Decemeber? I don't know. Come and find out! It is November,....November 1st to be exact this year, whatever year you are reading this in. The Backstreet Boys are celebrating together with their families in Kentucky at Brian's family's place. Can Brian and the guys take the pressure of having everyone under one roof. Will Nick help this year? Who will cook? How will they make the turkey? Grilled? Fried? Baked? Marinated? Or Order in from a local store? Will AJ cook? Will BSB survive this holiday? Is there any hope? What are the "surprises" Brian saw in his dreams? Are the guys having nightmares and dreams like Brian is? We'll see. 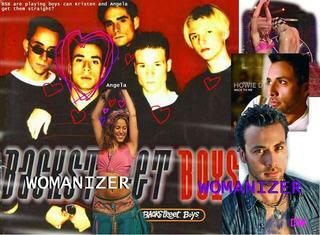 Sexual content just for BSB fantasies, nothing past PG-13 rating and even then like 1980's PG-13 rating. 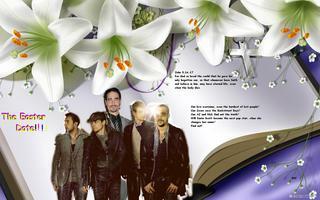 All background wallpaper courtesy of Backstreet Boys, Inc. and their permission and Dreamwallpapers.com. I don't work for them, just telling people what I used for my photoshop art. BSB is touring the USA in 1999, when they are stuck in Salem, MA. Specifically, where the Salem witch trials were held. That is when they run into a modern seer, who tells them, one of them will do something to wake the dead, and make their nightmares and fears all become real. They laugh it off at first, till their horrors come to scare them. A love story of a Christian BSB fan falling for Nick Carter, Jessica Heart, meets Nick Carter online they strike up a friendship, then he breaks her heart, now what will happen? The crying heart, will he save her when she looses faith and is lost in her tears and loneliness? Will he look for a better woman than Lauren who isn't all about the money? Find out! Watching a Western movie-a-thon on the NKOTBSB, the Backstreet Boys and New Kids on the Block enter the old Wild West of the late 1860's out from the Plains to the California coast and even the Organ trail. Can they save the small towns of Pensville and Jacob's drinks? Will they get home? Will AJ get married when they get back? Will Nick still love his favorite socks? Can they survive a showdown? We'll see.